Join the Climate Action Group of (UUCF) for a two hour workshop, “Reversing Global Warming: Introduction to Drawdown,” and learn what actions you can take to be part of the solution to climate change! This workshop will be the introduction to a three part Drawdown UUCF Movie Series coming this winter/spring. The workshop material is provided by the Pachamama Alliance and includes video clips of Paul Hawken. The presenter will be Lore Rosenthal, leader of Greenbelt Climate Action Network. 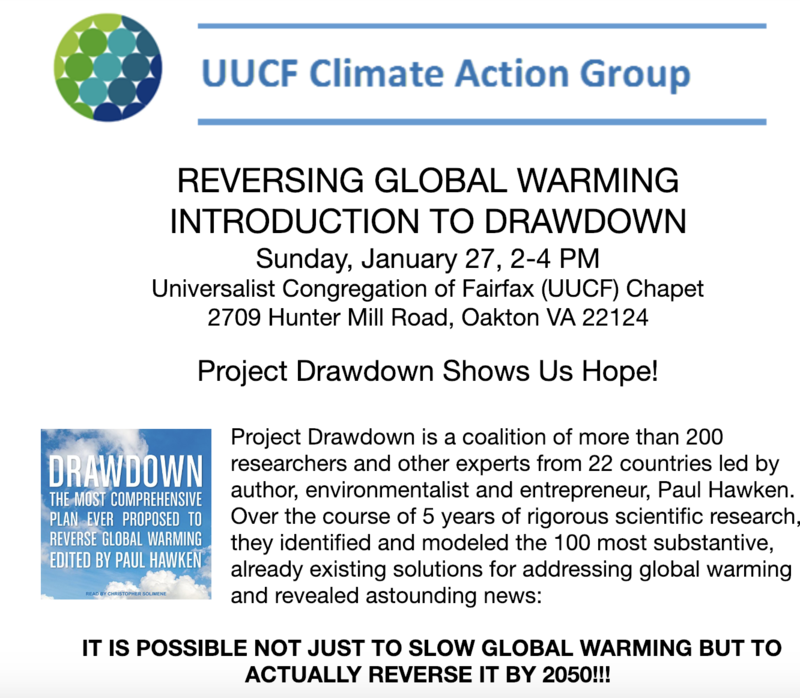 Project Drawdown is a coalition of more than 200 researchers and other experts from 22 countries led by author, environmentalist and entrepreneur, Paul Hawken. Over the course of 5 years of rigorous scientific research, they identified and modeled the 100 most substantive, already existing solutions for addressing global warming and revealed astounding news: IT IS POSSIBLE NOT JUST TO SLOW GLOBAL WARMING BUT TO ACTUALLY REVERSE IT BY 2050!!! The workshop material is provided by the Pachamama Alliance and includes video clips of Paul Hawken. The presenter will be Lore Rosenthal, a volunteer with the Pachamama Alliance, a global community working to create a sustainable future. Please be prompt as the workshop will take the full two hours. RSVPS are required due to the limited space.